Both the Rekon and Ikon aren’t Maxxis’s most aggressive tread patterns. The Rekon sports a mid-height knob (as opposed to their DHF or DHR which have really huge/tall knobs that are super aggressive) while the Ikon’s knobs are rather svelte and well spaced apart. Traditionally, I prefer a relatively aggressive tire up front that rolls fast paired with a slightly smoother faster rolling rear tire. A good majority of my rides are right from my shop doors so I typically have a 3 or 5 mile warm up to get to the two closest trailheads. That approach makes me cognizant of a tires rolling resistance as I’m in for 3-5 miles even before I reach the trailhead, and post trail portion I’m tacking on another 3-5 to get home. I’m a bit spoiled in the fact that 98% of either of the ride to either of those trailheads is on dirt roads… So tire wear over the course of the season of the tread isn’t too bad. It’s typically the sidewalls that see the most wear because of the volume of granite that liters our trails here in NH. So sidewall protection, specifically abrasion resistance is paramount. 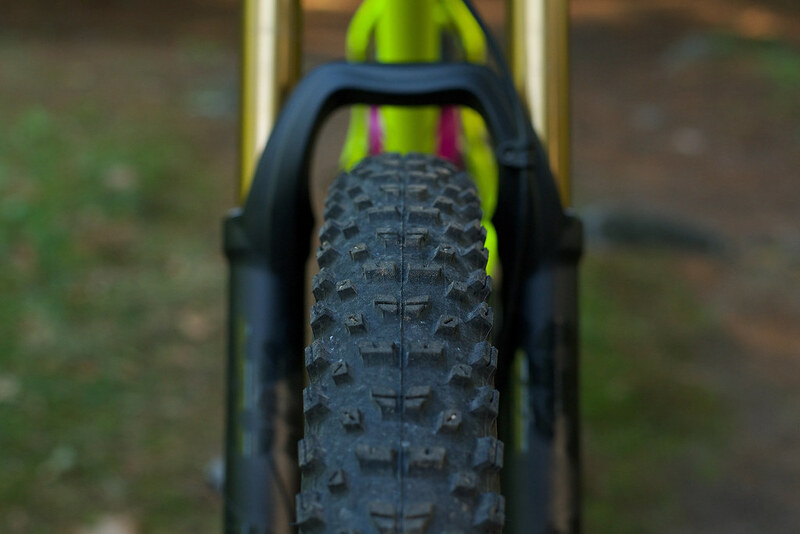 I was really impressed by Maxxis’s sidewall stoutness when running their tires in a 29″ diameter. For the course of this seasons riding, both tires were mounted to Nox Composites Kitsuma 275 which has a 36mm internal width. 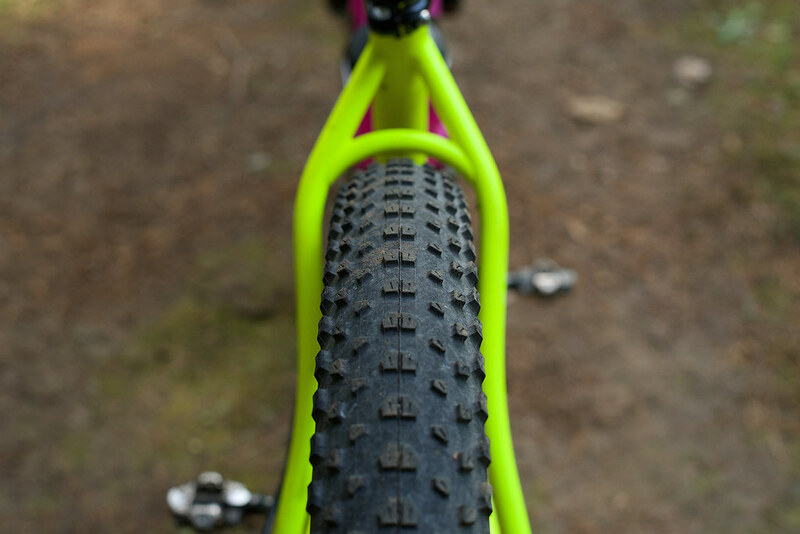 So those sidewalls stand nice and proud to make for a really nice full tire profile. None of that “light-bulb effect” here! For those wondering, these were laced with DT Swiss Competition Double butted spokes to Industry 9 Torch Classic hubs. 110mm front and 157mm rear. I’m not messing around with this build. 27.5 is a super fun wheel size. All the momentum and “roll-over-ability” of a 29″ wheel but the aggressive stance and ability to throw the bike around just like a 26″ wheel. IMO: These are just about the perfect mountain bike wheel size because it combines all the positive attributes of both 29 and 26 and fit a really wide range of rider heights/dimensions. Mount up was pretty easy and Nox’s hookless rim technology is pretty trick. These set up with a floor pump quickly using Orange Sealz tire sealant. I’ve learned my lesson with sealants: Always put more in than you think you need! For me and plus tires, that’s 2 full syringes full of sealant. Sometimes 3 and midway through the season, I’ll add a bit more just to make sure there’s some sloshing around inside. As I said, we’ve had a fair amount of rain this season which meant getting out for rides in between those rain spells had you tackling wet, slimy rocks and roots. And the Ikon tackled every single situation I threw at them up to this point with ease. But wet and slippery rocks and roots are this tires nemesis. Like Superman and Kryptonite… both wilt fairly quickly. You need to keep the bike upright vs leaning it through turns. Up and over rock walls was downright treacherous if you were off-camber. Tire pressure adjustments made a bit of a difference but that opened up the tire to rock strikes which in August on a group ride to celebrate the end of Hampshire 100 (Crotched Mtn. 100 so-called), just about ended my riding for the day. I was out with a group of the GTA (Greenfield Trails Association) about 3/4 through the ride when something stabbed my rear tire and I could hear the liquid fuzzling away back there. Rotating the tire and holding it low wasn’t working all that well because it was raining like crazy. It eventually sealed up after a lot of nursing but the group I was with had to wait a bit of time for me to deal with the leak. And I think that was a welcome sight somehow since everyone was pretty soaked and hungry. Upon return home and repairing the tire, the strike happened dead center of one of the large open expanse off-center of the tire. Both Rekon and Ikon shed mud/loamy soil really well. The Rekon, especially that day, I noted how well it gripped the trail which got my wheels turning about possibly swapping the Ikon for a paired F/R Rekon set up in the fall (Which I have since performed to amazing effect with all the leaves on-trail). Fast forward into the fall and early winter here in NH and leaves have dropped to litter the trail. My riding most days see me driving to the trail to enjoy the base I’ve built over the course of the warmer months and just enjoy the added fitness. No: The Ikon does not like leaves. There’s just nothing there to bite through the leaf fall. So I swapped that out for a Rekon pairing F/R early last week to good effect. There is some noticeable rumble on smooth sections of flat trail but again with all the rain, the trails have been fairly wet and loamy. I’ve been trying to be good about walking around large standing water sections. But a good portion of the trail system are still rideable. The local trail crews have been out grooming the trails but there’s still much of the system close to the shop that is littered with leaf fall and deadfall from recent storms and the coming of winter. The Rekon has been performing above and beyond expectations. 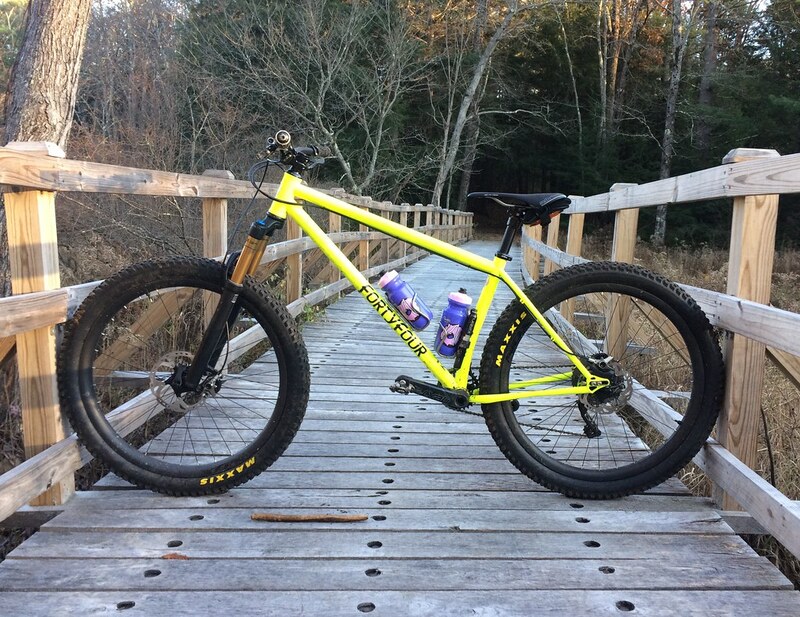 The Ikon performed well in dry, hardpack and loamy conditions when the trails were fairly dry and clear but when the trails turned wet for extended periods of time, the added size of the 2.8″ width made little difference. Overall, a great fast rolling tire with great sidewall abrasion resistance in dry conditions. Chatting with a friend recently, he joked that he ironically was trying to talk someone out of purchasing that tire for these same reasons. 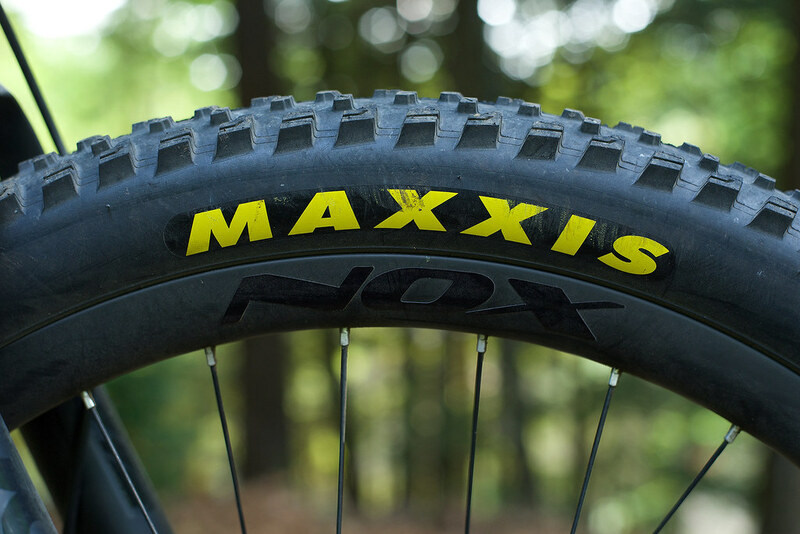 One of the tires I’d love to see in a larger 2.6 or 2.8″ profile from Maxxis is their Aggressor. 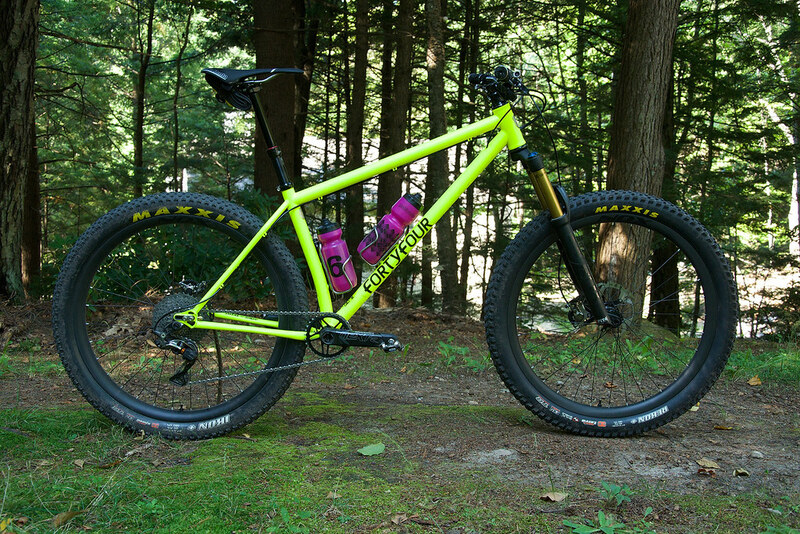 But for now, the Rekon has been tackling everything I’ve been throwing at it all season long and when paired front and rear, has been a great all around trail tire despite the wetness and leaves that Fall in New England bring. Check out the entire line up of Maxxis offerings via their bicycle portion of their mountain bike website. Till next post, keep pedaling.